Translation : Translator Ian Nicholson /FR Revised by Renée Sporre-Willes, Raymond Triquet and Claude Guintard. Brief historical summary : Etymologically, the French word “caniche” (Poodle) comes from “cane”, the French word for a female duck. In other countries, the name of the breed is associated with splashing around in water. Originally, this dog was used for wildfowling. It descends from the Barbet of which it has conserved many characteristics. In 1743, it was called the “caniche”: the female of the barbet in French. Thereafter the Barbet and the Caniche (Poodle) were gradually separated. Breeders worked hard to obtain original subjects of uniform colour. The Poodle became very popular as a companion dog because of its friendly, joyful and loyal character and also because of its four sizes and different colours which everyone can choose according to preference. General appearance: Dog of medium proportions, with a characteristic frizzy coat which is either curly or corded. The appearance is that of an intelligent dog, constantly alert and active, harmoniously built, giving an impression of elegance and pride. Important proportions: The length of the muzzle is approximately 9/10 of that of the skull. The length of the body (scapulo-ischial) is slightly more than the height at the withers. The height at the withers is practically equal to the height at the croup. The height at the elbow is 5/9 of the height at the withers. Behaviour / temperament: A dog renowned for its loyalty, capable of learning and being trained thus making it a particularly pleasant companion dog. Head: Distinguished, rectilinear and in proportion to the body. The head must be well chiselled and neither heavy nor excessively fine. Skull: Its width is less than half the length of the head. The entire skull, seen from above, appears oval and seen from the side, slightly convex. The axes of the skull and muzzle are slightly divergent. The superciliary arches are moderately pronounced and covered with long hair. The frontal furrow is wide between the eyes, narrowing towards the occiput, which is very pronounced. (In Miniatures it can be slightly less pronounced). Stop: Only slightly pronounced, but can never be absent. Nose: Developed, vertical profile; open nostrils. Black nose in black, white and grey subjects; brown nose in brown subjects. In fawn (apricot/red) subjects, the nose should be black or brown according to the intensity of the fawn colour. In light fawn subjects the nose should be as dark as possible. Muzzle: Upper profile is perfectly straight; its length is approximately 9/10 of that of the skull. The branches of the lower jaw are almost parallel. The muzzle is strong. The lower profile of the muzzle is determined by the lower jaw and not by the edge of the upper lip. Lips: Moderately developed, rather tight, of medium thickness with the upper lip resting on the lower lip without hanging over it. Black in black, white and grey subjects; brown in brown subjects. In orange fawn [apricot] and in red fawn subjects, the lips are more or less dark brown or black. The corner of the lips must not be pronounced. Jaws/Teeth: Complete scissor bite. Strong teeth. Cheeks: Not prominent, shaped on the bones. The sub-orbital regions are chiselled and very slightly filled. Zygomatic arches very slightly pronounced. corner of the eye; flat, widening after the attachment and rounded at the tip, they are covered with very long, wavy hair. The leather should reach – or ideally pass – the corner of the lips when pulled forward. Neck: Strong, slightly arched after the nape, of medium length and well proportioned. The head is carried high and proudly. The neck, without dewlap, is of oval cross section. Its length is slightly less than that of the head. Body: Well proportioned. It is slightly longer than the height at the withers. Top line: harmonious and taut. Withers: Moderately developed. The height at the withers is practically equal to the height from the top of the croup to the ground. Croup: Rounded but not falling away. Chest: Reaching the elbow; its width is equal to 2/3 of its depth. Forechest, the point of the sternum should be slightly prominent and set rather high. In Standard Poodles, the perimeter of the thorax, measured behind the shoulders, should measure 10 cm more than the height at the withers. Oval cross section, broad at the dorsal part. Underline and belly: Tucked up but not excessively so. Tail: Set on quite high at the level of the loin (ideally carried at a “ten past nine” compared to the topline). General appearance: Perfectly upright and parallel, well muscled with good bone. The height from the elbow to the ground is slightly more than half the height at the withers. Shoulder: Oblique, muscular. The shoulder blade forms an angle of approximately 110° to the humerus. Upper arm: The length of the humerus corresponds to that of the shoulder blade. Carpus (Wrist): In continuous line with front of the forearm. Metacarpus (Pastern): Strong and almost upright seen in profile. Forefeet: Rather small, firm, of short oval shape. Toes are well arched and tight fitting. The pads are hard and thick. The nails are black in black and grey subjects. They are brown in brown subjects. In whites the nails may be any colour in the range from horn colour to black. In the fawns they are brown or black; according to coat colour, as dark as possible. General appearance: Hind legs parallel seen from behind; muscles developed and very apparent. Thigh: Well muscled and strong. Coxo-femoral angle should be pronounced. Stifle (Knee): Femoro-tibial angles should be pronounced. Hock joint: The hock joint is relatively well angulated. (tibio-tarsal joint should be well angulated). Metatarsus (Rear pastern): Rather short and upright. The Poodle should be born without dewclaws on the hind legs. Hind feet: Rather small, firm, of short oval shape. Toes are well arched and tight fitting. The pads are hard and thick. The nails are black in black and grey subjects. They are brown in brown subjects. In whites the nails may be any colour in the range from horn colour to black. In the fawns they are brown or black. Gait / movement: The Poodle has a light and bouncy gait. Skin: Supple, not loose, pigmented. Black, brown, grey and fawn Poodles must be pigmented in accordance with the colour of their coat. In white Poodles, a silver coloured skin is sought after. Curly Coat: Profuse of fine, woolly texture, very frizzy, elastic and resistant to pressure of the hand. It should be thick, well furnished, of equal length and form even curls. Corded Coat: Profuse of fine, woolly texture and dense, forming characteristic cords which should measure at least 20 cm. Size and weight: The sexual dimorphism must be clearly visible in all varieties. 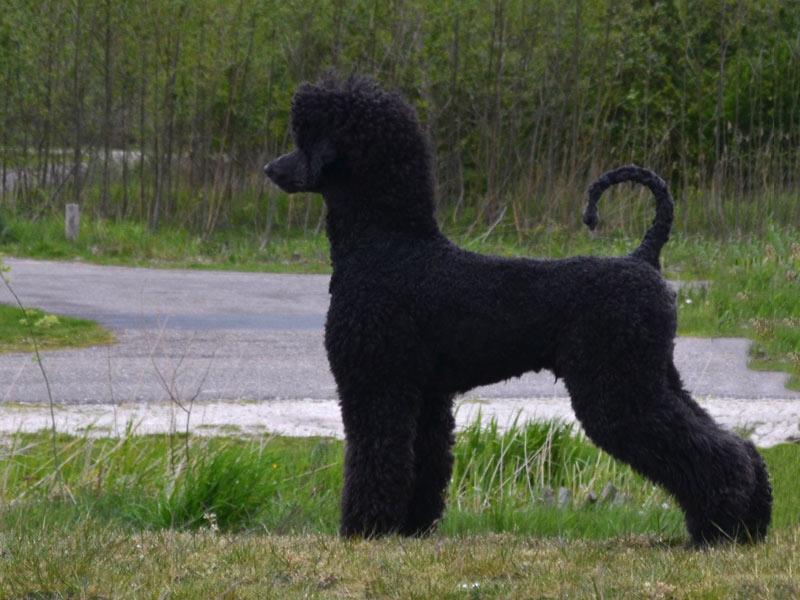 Standard Poodles: Over 45 cm up to 60 cm with a tolerance of +2 cm. The Standard Poodle must be the enlarged and developed replica of the Medium Poodle of which it retains the same characteristics. Medium Poodles: Over 35 cm up to 45 cm. Miniature Poodles: Over 28 cm up to 35 cm. The Miniature Poodle must display the appearance of a reduced Medium Poodle, retaining as much as possible the same proportions and without presenting any sign of dwarfism. Toy Poodles: Over 24 cm (with a tolerance of -1cm) up to 28 cm (sought after ideal: 25 cm). The Toy Poodle maintains, in its ensemble, the aspect of a Miniature Poodle and the same general proportions complying with all the points of the standard. Any sign of dwarfism is excluded; only the external occipital protuberance may be less pronounced. Eyes: too big and too round, or sunken, not dark enough. Ears: too short (not reaching the corner of the lips). Tail set on too low. Rear angulations too straight or over-angulated. Sparse, soft or wire hair. Undefined or not solid colour. Aggressive or overly shy dogs. Any dog clearly showing physical or behavioural abnormalities will be disqualified. Lacks type and particularly in head, hinting notably at a mixture with another breed. Height exceeding 62cm in Standards and less than 23 cm in Toys. Absence of tail or naturally short tail. Dewclaws or evidence of dewclaws on rear limbs. Any subject displaying signs of dwarfism: globulous skull, absence of occipital protuberance, very pronounced stop, prominent eyes, muzzle too short and turned up. Very light bone in Toys. Subjects whose coat is not of solid colour. All white marks on the body and/or feet for all subjects other than white. Every tooth position which could injure the dog (for instance: ill-positioned canine that touches the palate). Absence of 1 incisor or 1 canine or 1 carnassial. Absence of one PM3 or of one PM4. Absence of three or more PM (except PM1). Only functionally and clinically healthy dogs, with breed typical conformation, should be used for breeding. Judging a Poodle in a show does not mean it is judged in a grooming contest. It is not encouraged to stimulate overgrooming one’s dog. “Lion Clip”: The Poodle, whether curly or corded, shall be clipped on the hindquarters up to the ribs. Also clipped: the muzzle, above and underneath from the lower eyelids; the cheeks; the forelegs and hindlegs, except for the cuffs or bracelets and optional motifs on the hindquarters; the tail, except for round or oblong terminal pompom. A moustache is required for all subjects. Leaving hair, called “trousers”, on the forelegs is admitted. a) The lower part of the forelegs, from the nails to the tip of the dewclaw, the lower part of the hindlegs to the same height. Machine clipping, limited to the toes only, is admitted. b) The head and the tail in compliance with rules described above. The presence, under the lower jaw, of short hair no longer than 1cm the lower line of which should be cut parallel to the lower jaw. A beard, called “goat’s beard”, is not permitted. The suppression of the pompom on the tail. Over the body, in order to give “shot silk” effect on the line of the back, more or less long but at least 1cm. The length shall be gradually increased over the ribs and above the limbs. increase gradually, from top to bottom, to end in fringes which may be levelled. are eliminatory. Whatever the standard outline obtained by grooming, it should have no influence whatsoever on the placements in shows, all exhibits in the same class should be judged and placed together. “English Clip”: To the “Lion Clip” add motifs on the hindquarters, i.e. bracelets and cuffs. On the head: a topknot. For this clip the moustache is optional. The absence of demarcation on the hair of the hindquarters is tolerated. The topknot is optional (it is forbidden to use lacquer or any other substance to keep the topknot in place). “Puppy Clip”: Takes over the several shaven parts which characterize the Modern clip. On the head: a topknot of a reasonable height. The coat on the forequarters should form a ball, comparable to an ‘egg’ seen from the forechest up to the topknot. The so-called ‘trousers’ on the forequarters is preserved, accentuating the typical poodle angulation. The tail – save for a pompon – should have an oval or oblong shape. It should be clipped longer than wide with rounded angles. “Scandinavian clip or Terrier clip”: The clip is similar to that of the Modern clip, the difference being that the ears and tail may be shaven. The latest amendments are in bold characters.